"Even the best excuses don't feel as good as success." A prospect has to hear about you 7 to 10 times before they buy. That's why running a single ad or distributing one flyer is a waste of time and money. There are far more effective ways to build your staging business. By the way, did you know that a 1% response rate to a flyer is considered excellent? So, if you send out 1000 of them, you'll be VERY lucky to get 10 responses. From the 10 that do respond, you're doing well if you can convert 5 into paying clients. Do the math, 1000 flyers and only 5 clients (if you're lucky). How much does that cost per client? And, how long would it take you to write, design, print and distribute your flier? To learn how to market your staging business more effectively and get the "7 to 10 Rule" working for you, consider ordering course 4 of the Staging Diva Program. Better yet take the whole program and I can refer projects to you once you're a graduate! I've learned about a fabulous F.R.E.E. 89 day tutorial you can sign up for on how to write effective press releases. Each lesson comes to you by email and is taught by someone I greatly respect, Joan Stewart, The Publicity Hound. 1. It's the perfect way to promote our talents and portfolio with next to no effort on your part! 2. You send me copy and photos and I build your page, create your links and metatags (that's something search engines look for). 3. You will boost the credibility of your own business by being associated with the Staging Diva name. 4. You benefit from all the effort I put into building traffic to stagingdiva.com. 5. Prospects can read about you and see your portfolio, without you having to meet them in person (this saves you valuable time). 6. The media who already find me, will find you! Imagine being able to say you were interviewed by The Wall Street Journal or that your business is being featured in a book about staging! It's happened for other Gradutes because of their Directory listing and it can happen for you too! 7. It gives you time to build your own site. 8. Once you have your own site, a link from your Staging Diva Directory page to your own site will drive traffic to your site and boost your search engine ranking. 9. You won't have to wait the 3 to 6 months it normally takes for a new site to be discovered by Google and other search engines. 10. Even with only one staging project all year you'll cover the cost of your full Staging Diva Training Program, plus having your Staging Diva Directory page built and hosted on the stagingdiva.com site for a full year! I answer questions within this forum and you also get advice from others in the group. You'll learn lots and feel inspired by the discussions with your fellow Staging Diva Graduates. September always feels like a new year beginning. It's back to school for my daughter but it's also a time when I like to start new projects and introduce new things. This year is no exception. I'm especially excited about my new "blog" (see article below). Not only will it give you a great new resource for information about The Business of Home Staging, it will also significantly boost traffic to the Staging Diva site, which means more projects for any of my Graduates listed there. I hope you find the content of this newsletter helpful; and I welcome any feedback! Announcing "The Business of Home Staging"
I've had more home staging projects recently with no graduates to refer the clients to. They were in St. Charles County MO, Jefferson County MO, North Smithfield RI, Detroit Lakes MN and Guelph ON. If you're in any of these areas and you weren't sure whether you wanted to proceed with Staging Diva Training, I can tell you that any of these projects would have more than covered the cost! If you've started your own home staging business, what do you say when someone asks, "what do you do?." You should always be prepared for this question because how you handle it is one of your most effective marketing tools, and it's f.re.e.! You might be in a casual conversation at your kid's soccer game, standing in line at the grocery store, or you might be attending a gala dinner.... prospective clients are everywhere. There are many tricks to answering the "what do you do?" question and one of the key ones is making sure that your answer is phrased to show the listener what's in it for them. In other words, show them clearly why what you do can directly benefit them or someone they know. We discuss "how to write your infomercial" in course 4 of The Staging Diva Training Program and it's also covered in Lesson #12 of The Staging Diva Biz Booster eCourse. Within 2 days this house went from an unfurnished mess to an attractive but modest home perfect for first time buyers. And only 3 days later there was a SOLD sign on the front lawn! This was especially important as the owner had suffered a terrible stroke and needed to get her money out fast for medical care. It was an incredible feeling to be able to help someone in this way. I didn't charge her for my services in view of her circumstances and I was able to get all the furniture and accessories together for her for about $1000. When she sold the house on the first day of the first open house, it was quite a relief. Not all home staging projects that require furnishing an entire house, are under such dramatic circumstances or need to be finished in only 48 hours, but it was a real adrenalin high doing it! I felt like I was on one of those weekend home makeover shows! After staging hundreds of homes I can honestly say that no matter what the client's circumstances, we are generally doing work that makes such a huge difference in our client's lives and that's very satisfying. Many of my clients are divorcing couples. It is a huge relief to them to have an independent third party come in and make the decisions about what should be done to get the house ready for sale. They know I have no vested interest in the husband's or wife's point of view! I just tell it like it is! In many cases they make enough profit on my services that both of them are able to move on and have down payments for separate houses. Sometimes they both call me back to help decorate their new homes. In the coming weeks, you'll be getting an email from me with the subject line "Staging Diva Newsflash". It's important that you respond to it to stay on my email list. I'm moving over to a new system to make it easier to communicate with you and automate order fulfillment. For example, with the new system, when you order a course recording or ebook or special report from the Staging Diva site, it won't matter if I'm sitting at my desk to send it to you. It will be sent automatically within minutes, day or night. As part of this automation, I need you to confirm that you still want to receive information from me. So when you see an email from me called "Staging Diva Newsflash" in the weeks ahead, please follow the instructions to ensure you continue receiving copies of this F.R.E.E. monthly newsletter, Staging Diva Dispatch. Congratulations to Gary Baugher, An Eye 4 Change (TN) who staged his first house and it sold the same day it hit the market. When the agent also received two back up offers, she was absolutely sold on staging. For his second project he brought in rental furnishings for a $600,000 bachelor pad that had sat on the market for 60 days. The agent didn't believe in staging until she went to take her new photos and was blown away by the transformation. Way to go Gary! Congratulations Allegra Shann, Styled and Sold (MD) who is now the home stager of choice for the largest luxury home builder in the US. They'll be paying $3,000 towards her staging fees for any of their clients who also need to sell their current homes. Allegra reports, "they found me from my listing in the Staging Diva Directory of Home Stagers!" How's that for a return on investment of only $795 for the full Staging Diva Training Program plus another $695 for her directory listing, which is only 4 months old? Let's see what additional new business she gets over the next 8 months! Congratulations to Charlene Yackanich Put Your Best House Forward Inc. (FL) on being interviewed by The Wall Street Journal and on having an article she wrote published in a local magazine this fall! We discussed strategies for making this happen in course 4 "Staging Diva Sales & Marketing Secrets to Boost your Home Staging Business"
It's amazing what paint, accesories and removing old shower doors can do. Congratulations to Margaret Baxter of Turnkey Staging (CA) who took a waterfront home with a best offer of $1.9 million and staged it and sold for $2.45 million! How's that for a staging success story, and on one of her first projects! The agent loved it so much he wants her to work on a $5 million home next! 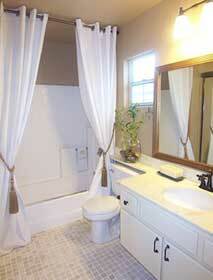 This bathroom makeover is from Peggy's listing in the Staging Diva Directory of Home Stagers! What's a "blog"? It's Internet jargon for a weblog. In my case, it's an almost daily diary of my thoughts on the business of home staging. I've created the new The Business of Home Staging blog to increase awareness and understanding of what it takes to start and grow a successful home staging business, that not only meets client's needs, but is creatively satisfying and profitable for the individuals who start them. It takes a lot of time, energy and courage to be an entrepreneur, I know because I've been one since 1989. Through The Business of Home Staging, I want to provide inspiration, helpful information and celebrate the successes of others on the road of operating a home staging business. It's in it's early stages so "the look" is still being revised, but as a subscriber to Staging Diva Dispatch, I wanted you to be one of the first to get a look at it. There are lots of articles already there for you to read and you're invited to add your comments to the stories so that we can start a dialog about the business of home staging. After all, it's a lot for me to generate all the content myself and different points of view will enhance everyone's understanding. As of my deadline to get this newsletter out to you, I still don't have the covers to share with you and don't have publication dates. But, I'll be featured in the October issue of House & Home Magazine and in the upcoming FabJob Guide to Home Staging. More on these in the October issue of Staging Diva Dispatch. With more media exposure and more Internet traffic to http://www.sixelements.com/ and http://www.stagingdiva.com/,more people are educated about what staging can do; which makes your sales job easier. With every media appearance, I get calls from people looking for a home stager in their market. 98% of the time, the Graduates who actually get work from my referrals have a page on the Staging Diva Directory and/or their own website. It's rare for someone to hire a stager when they can't see samples of their work. What projects are you missing out on? What are these lost opportunities costing you?